Like thousands of others, I was in shock at this horrific news. Although we find it impossible to process the shocking details of such acts, this is further exacerbated by the fact we are no longer accustomed, in recent times, to such dark news. I got to know Jock about ten years ago when a large contingent of us did a sponsored cycle around Cuba as part of an international delegation that raised money and collected resources for the Abel Santa Maria school in Havana. He made an impression on me straight away with the personable, unassuming and humble way he engaged with people. He had no delusions of grandeur and treated everyone with the same attention and respect. Despite the fact that he had been through an immensely difficult and challenging period in the months preceding the cycle, where he had been publicly vilified in the media, he bore no ill-will, resentment or bitterness towards those who denigrated him. He struck me as someone, who was not only imbued with internationalist politics and socialist principles, but more importantly as someone who was defined by a humanity, honesty and integrity that shaped his every interaction. It was clear that these unique qualities had helped shape his reputation as a courageous activist who had stood up for his community in its hour of need while they found themselves under siege from British military occupation and Loyalist death squads. In the bloody conflict that engulfed our society, Gerard, like many thousands of others, played an active role. The people of the Short Strand remember with gratitude the leadership he showed during the infamous Loyalist Pogrom in the summer of 2002. 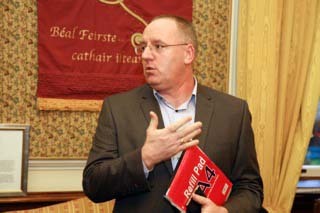 Not only did he actively resist the Loyalist attacks, but he also arranged with comrades in Cork for the safe relocation of the young people of the district, for a couple of weeks respite from the incessant trouble. In addition, it was the same leadership skills that allowed him to both reinvent and re-develop himself as the manager of the community centre in the Market from 2008 onwards. In area of significant socio-economic disadvantage, Jock was able to able to inspire those around him to challenge the authorities on issues of rights and resources. This is clearly evident in the Tunnels Regeneration Project that he spearheaded and that Belfast City Council is to ratify with investment of more than a million pound for the Market are. He returned to adult education and University while igniting the confidence in others that they could also make do for themselves. He attracted committed and competent young people into activism which resulted in numerous community empowerment projects which now take place on a weekly basis. People understood that he was independent of party politics and any sectional organisational interests which enabled him to build solid relationships throughout the city, with activists and groups from differing backgrounds. It is this true representation of Gerard that was occluded from the media narrative since his recent murder. Neither the voice of the community nor his family’s grief were taken into account while he was character assassinated with baseless historic accusations that were not backed with a shred of evidence. Conversely, when a well-known community worker is gunned down just 20 yards from his community centre, a few politicians spoke of the dangers of ‘gun law’ whilst the ‘official’ community and voluntary sector and civic society remained silent. Why the silence? What type of society do we live in, when Jock’s murder is not seen as an attack on ‘peace’ and the struggle of working-class communities more generally? Was it simply the elections that pushed Jock’s murder to the bottom of the headlines within a two days? Or was it that his republican background rendered him deserving of the depersonalisation and dehumanisation he has been subject to since his death? What does this tell on about the legacy of the Peace process when some pigs appear to be more equal than others? The solidarity advert in this newspaper and others, that was signed by almost 70 community organisations from throughout the city, indicate exactly how much esteem that Jock Davison was held in. It is an outrage, however, that groups had to take this public stand in order to set the truth free and put the record straight. This is exactly what Jock himself did, when he co-ordinated a similar solidarity advert in the media on behalf of the people of Palestine while they were under attack last summer. He understood the need for an alternative narrative and stood resolutely with those suffering under the jackboot of tyranny; those communities on the margins. Ní dhéanfar dearmad air go deo na ndeor. Ní bheidh a leithéid arís ann. Bhí mé ag machnamh ar Bhobby Sands maidin Mháirt seo caite, mar a bhím i gcónaí ar an 5ú lá Bealtaine. Bhí Facebook agus Twitter flúirseach le grianghrafanna agus athfhriotail fá éachtaí cróga s’aige ceithre bliana is tríocha ní ba luaithe. Is ag léamh fríd cuid acu a bhí mé nuair a fuair mé an scairt tromchúiseach gur scaoileadh Gerard ‘Jock’ Davison chun báis. Dála na mílte eile, baineadh geit agus suaitheamh millteanach asam. Bíonn sé dodhéanta againn ariamh a leithéid de dhrochscéal a phróiseáil, ach fiche oiread níos deacra nuair nach bhfuil muid chomh cleachtaithe sna laethanta seo, le nuacht dorcha den chineál seo. Chuir mise aithne cheart ar ‘Jock’ timpeall deich mbliain ó shin nuair a rinne baicle mór againn rothaíocht urraithe thart ar Chúba mar thoscaireacht idirnáisiúnta a bhailigh airgead agus áiseanna don scoil Abel Santa Maria in Havana. Chuaigh sé i bhfeidhm orm láithreach leis an bhealach pearsanta agus umhal a phléigh sé le daoine. Níor shíl sé a mhór do féin agus chaith sé le gach duine ar an bhonn cothrom céanna. Ainneoin go ndeachaigh sé fríd fíor droch-am sna míonna roimhe sin, inar ndearnadh slad pearsanta air sna meáin chumarsáide, níor léirigh sé aon searbhas nó fearg ar chóir ar bith ina n-eádan iad siúd a cháin é. Chuaigh sé i bhfeidhm orm, ní amháin mar idirnáisiúnaí le prionsabail an tsóisialachais go smior ann, ach níos tábhachtaí mar dhuine le daonnacht, ionracas agus macantacht ina chroí. Is léir gur na buanna speisialta seo a thoiligh clú do mar throdaí croga in am an ghátair agus pobal s’aige faoi léigear ag forlámhas Arm na Breataine agus foréigean dílseach. Sa chogadh fuilteach a ghlac seilbh ar sochaí s’againn, bhí Gerard i measc na mílte eile a ghlac páirt ann. Cuimhníonn muintir na Trá Giorra le buíochas ar an cheannasaíocht a thaispeáin sé sa Phogram Dílseach a d’fhulaing an ceantar i Samhradh 2002. Chan amháin gur sheas sé an fód in aghaidh na n-ionsaithe dílseacha ach shocraigh sé le comrádaithe i gCorcaigh go ndéanfar aos óg an cheantair a bhogadh thíos ar feadh roinnt seachtaine saoire le héalú ón trioblóid. Lena chois sin, is na buanna agus scileanna ceannasaíochta céanna a thug deis do é féin a athchruthú agus a fhorbairt mar bhainisteoir pobail sna Margaí ó 2008 i leith. I gceantar faoi mhíbhuntáiste suntasach soch-eacnamaíochta, bhí Jock in ann daoine thart air a eagrú agus spreagadh chun dúshlán na n-údáras a ghlacadh ar cheisteanna ceartais agus achmhainní. Feictear seo go sonrach i dtionscadail athghiniúna na dTollán a stiúraigh sé agus atá Comhairle Bhéal Feirste le daingniú le infheistíocht na milliún punt do cheantar na Margaí. D’fhill sé ar an ollscoil agus ar an oideachas agus thóg sé muinín sa phobal go dtiocfadh leo déanamh as dóibh féin chomh maith. Mheall sé daoine óga cumasacha chun gnímh agus d’eascair an iliomad togra cumhachtaithe pobail atá á reáchtáil anois ar bhonn seachtainiúil. Thuig daoine go raibh sé neamhspleách ar an pholaitíocht pháirtí agus suimeanna seichteacha eagraíochtúla agus chuidigh seo leis caidrimh bhuana a dhéanamh ar fud na cathrach, le díograiseoirí agus grúpaí ó chúlraí eagsúla. Is an fhírinne seo a bhí faoi cheilt sna meáin ó dunmharaíodh é seachtain ó shin. Níor cuireadh guth an phobail nó méala an teaghlaigh s’aige san áireamh, nuair a cuireadh maslaí suaracha agus líomhaintí stairiúla ina leith gan aon bhunús nó pioc fianaise ar bith. Os a choinne sin, nuair a scaoileadh oibrí pobail iomráiteach chun báis agus é 20 slat ón Ionad Pobail, labhair roinnt polaiteoirí ar contúirtí an ‘dlí ghunna’ ach bhí an earnáil phobail agus dheonach ‘oifigiúil’ agus sochaí sibhialta ina thost. Cad chuige an ciúnas? Cén cineál Sochaí ata againn nár glacadh le dúnmharú Jock mar ionsaí ar ‘síocháin’ agus streachailt na cosmhuintire i gcoitinne? An iad na toghcháin amháin a bhrúigh dúnmharú Jock siar go bun na ceannlínte nuachta taobh istigh de chúpla lá? Nó an é gur chiallaigh cúlra Poblachtánach s’aige go raibh an díphearsanú agus dídhaonnú poiblí a rinneadh air tuillte go maith aige? Cén cineál léiriú é seo ar oidhreacht an phróisis shíochána, nuair a bhíonn roinnt muc níos cothroime ná a chéile? Léiríonn an fógra dlúthpháirtíochta atá sa pháipeár seo agus roinnt nuachtán eile, atá sínithe ag beagnach 70 grúpa pobail ó fud fad na cathrach, go díreach cé mhéid meas a bhí ar Jock Davison sa phobal. Is náiriúil an scéal, áfach, gurbh éigean do ghrúpaí an seasamh poiblí seo a ghlacadh leis an fhírinne a scaoileadh saor agus a chur ar a súile don saol mór. Is amhlaidh a rinne Jock féin anuraidh nuair a d’eagraigh sé freagra den chineál céanna ó ghrúpaí pobail a chuir fógra dlúthpháirtíochta sna meáin ar son phobal na Palaístíne agus iad faoi léigear an samhradh seo caite. Thuig sé go raibh leagan eile den scéal de dhíth agus sheas sé i gcónaí leo siúd a d’fhulaing cos-ar-bolg an mhaistín; pobail ar an imeall. D’fhéadfaí a mhaíomh mar sin, go raibh sé feiliúnach agus íorónach gur imigh sé ar shlí na fírinne ar an lá céanna le Bobby Sands, gníomhaire tiomanta agus neamhleithleasach eile a throid ar son pobail faoi chois. Gaeil eile a chreid in ‘meon na saoirse’ agus an tuiscint go bhfeicfidh muid ‘éirí na Gealaí’.